I have fond memories of family pizza night. Dad used to cook up at least a pound of hamburger to mix together a variety of red sauces to form his very special pizza sauce. My sister and I would play with the flour and dough, making a huge mess but having a blast, too. My mother would run around cleaning up after us and preparing the toppings. However, in all our years of pizza making, the toppings were almost always the same: pepperoni, mushrooms, onions, and tons of cheese. 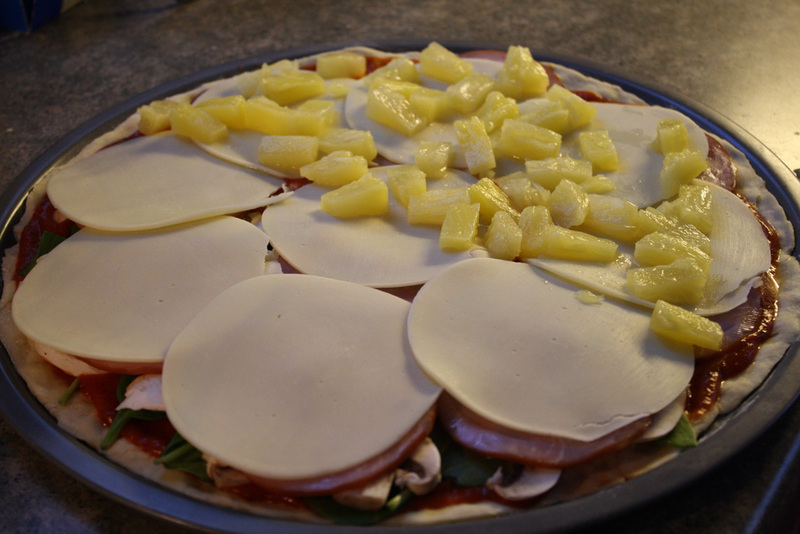 While I loved those pizzas, I decided to venture out a bit more and try my hand at a Hawaiian pizza. I was not disappointed with my results! 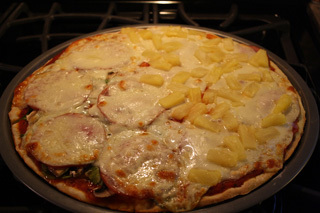 Make the crust as per the directions (add water to pizza crust, mix until dough forms, let sit for 5 minutes to rise). 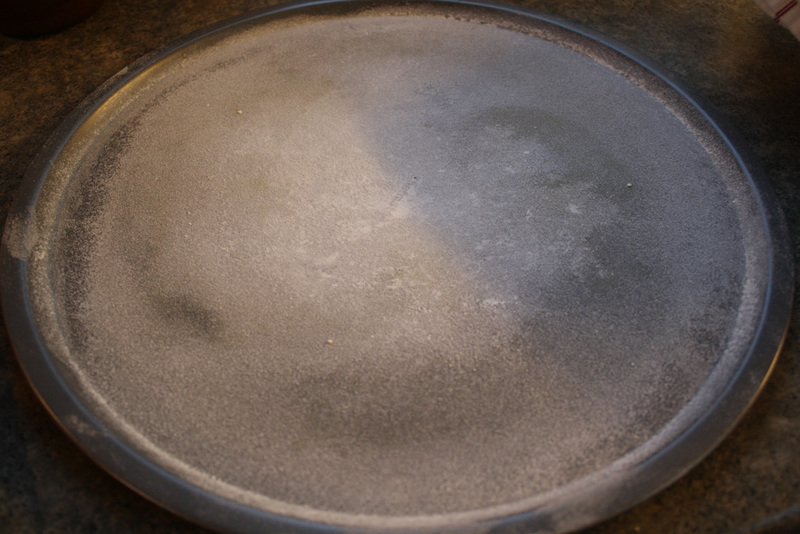 Spray a 12" pizza pan with a butter flavored spray. 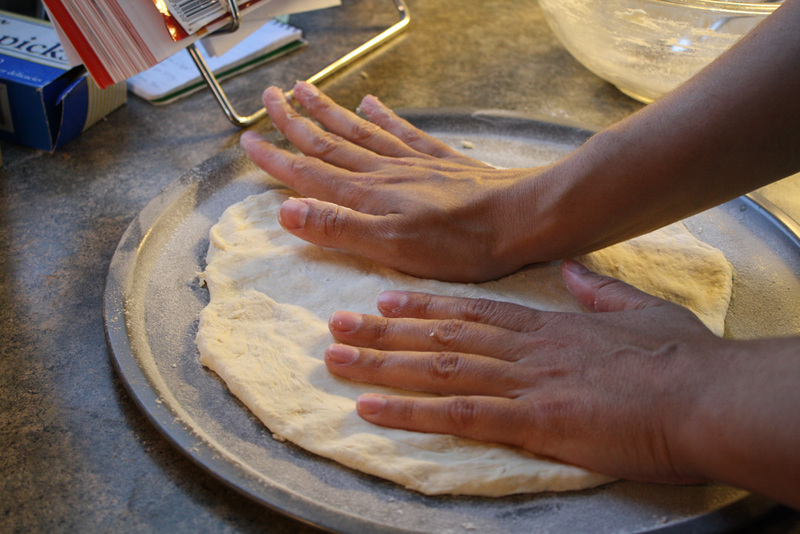 Lightly coat with flour, tapping the sides of the pan to move the excess flour around. Then, use your hands to "roll out" the dough on the pizza pan to its edges. Pour about half a 15 oz can of pizza sauce on the dough and use a spoon to spread it evenly. Add more sauce if you desire. Then place the Canadian bacon and Provolone cheese slices evenly around the pizza. Finally, top with pineapple tidbits. Cook in the oven for about 9-12 minutes, or until cheese melts and crust is fully cooked. Enjoy this amazing pizza with a side of garlic cheese bread or just by itself. You will be pleased with how easy it is to make this delight! Note: the pizza pictured here is half Hawaiian, half mushroom spinach due to a guest's dislike of pineapple on their pizza.